If I were the type to make bold proclamations I would probably consider “taking my shot” right here and shout “This is the Top” and/or “The Market May Crash.” Unfortunately, on those occasions (well) in the past when I would make bold public predictions of what was about to happen in the financial markets I would almost invariably end up looking pretty stupid. So even if I did make a “bold proclamation” it wouldn’t necessarily mean that anyone should pay any attention. Besides all that the last thing I want is for “the party to end”. Even if you do think the market is about to tank it’s a pretty crummy thing to have to root for. Even if you did manage to “call the top”, the ripple effect of the ramifications associated with a serious stock market decline can have pretty negative effect on just about everyone’s life. So let’s put it this way: I am concerned – and prepared to act defensively if necessary – but still have money in the market and am still hoping for the best. Figure 1 displays four major indexes. The Dow keeps hitting new highs day after day while the others – at the moment – are failing to confirm. That doesn’t mean that they won’t in the days ahead. But the longer this trend persists the more negative the potential implications. Figure 2 displays 4 “bellwethers” that I follow which may give some early warning signs. *SMH soared to a high in early June and has been floundering a bit since. *Dow Transports tried to break out to the upside in July but failed miserably. *XIV is comfortably in new high territory. *BID tried to break out in July and then collapsed. It is presently about 12% off of its high. In a nutshell – 3 of the 4 are presently flashing warning signs. It should be noted that the indicators signals are often early and occasionally flat out wrong. Still, a churning market with the Dow making new highs has often served as a “classic” warning sign. Again, and for the record, I do not possess the ability to “predict” the markets. But I have seen a few “warning signs” flash bright red at times in the past. As a general rule, it is best to at least pay attention – and maybe make a few “contingency plans” – you know, just in case. Here’s hoping my gut is wrong – again. Jay Kaeppel Chief Market Analyst at JayOnTheMarkets.com and AIQ TradingExpert Pro (http://www.aiqsystems.com) client. In real estate, it’s “Location, Location, Location.” In the financial markets it’s “the Trend, the Trend, the Trend.” There is a great deal of certainty about what will happen next in stocks, bonds and gold. But the key to successfully navigating these turbulent times starts not with predicting the future but rather with identifying the current trend in the here and now and going from there. So let’s take a look at, well, what else, the trends. I have certain trend-following models that I follow to help me to determine which way to be leaning in the markets. Like any trend-following method they are far from perfect (my stock market model for example, suffered not one but two significant whipsaws in the last year+). But for me there is no expectation that they will be perfect. The only goal is to catch most of the upside during major bull markets, and miss much of the downside during major bear markets. This method avoided much of the 1973-1974, 2000-2002 and 2008 bear market destruction. That’s the good news. The bad news is that it sold at the end of September 2015 and at the end of February 2016 – both just prior to powerful upside reversals (like I said, trend-following models ain’t perfect). The most recent signal was a buy signal on 3/31/2016. For gold I use two moving averages on a weekly chart for something I refer to as Jay’s Anti-Gold Index. Rather than go into a long explanation I will link to the original article on the topic and offer a short explanation. In AIQ TradingExpert I created a ticker comprised of 4 other tickers (GLL, RYSDX, SPX and YCS) which all trade in a negatively correlated manner to the price of gold (er, usually). One moving average I call the “FrontWeighted36DayMA” (“FrontWeightedMA” for short. The calculations are based on someone else’s work – unfortunately I cannot recall the person’s name so cannot give proper credit. Hopefully Karma will work and somewhere that person will Have a Nice Day without really knowing why. The calculations are a bit long-winded so the AIQ TradingExpert code appears at the end of this article. The other is the 55-week exponential moving average. *When the FrontWeightedMA closes a week BELOW the 55-week MA then a BUY signal for gold occurs. *When the FrontWeightedMA closes a week ABOVE the 55-week MA then a BUY signal for gold occurs. The most recent signal was a buy signal on 3/18/16. So the trend for gold is presently BULLISH. These indicators represent “my opinion as to where the markets are headed next” (because the truth is I don’t know). There are objective, mechanical measures of where things stand today. Nothing more, nothing less. Also, none these indicators falls into the “World Beater” or “You Can’t Lose in Investing” categories. But then again they are not really designed to (BTW if you do posses methods that do fit into either of the aforementioned categories, I would love to hear from you – off the record, of course). What they do achieve is to offer a decent frame of reference during times of doubt. And that is one of the most powerful tools any investor can possess. So in sum, the current trend (at least according to what you’ve seen here) for stocks and gold is bullish and the current trend for bonds is bearish. How long any of these trends will remain in place is anyone’s guess. So enjoy them while they last. Chart Pattern Recognition – Lock in 2008 pricing 5 days remaining! 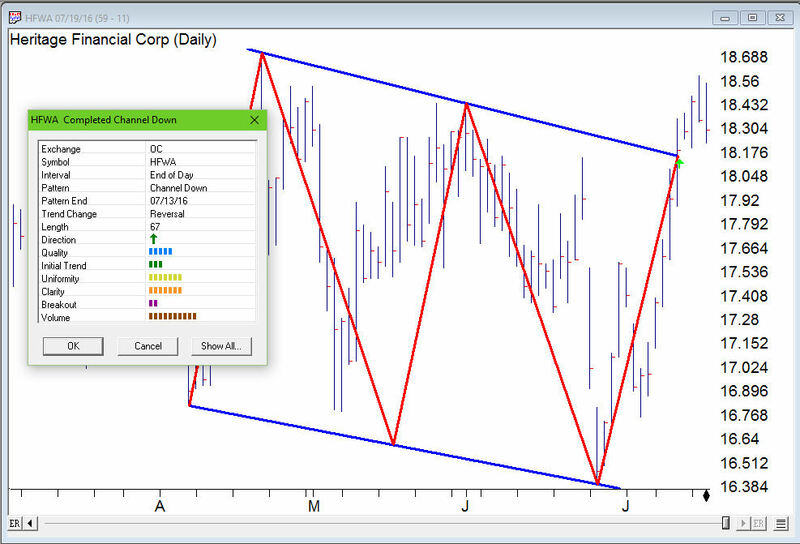 Why add Chart Pattern to your TradingExpert Pro? you'll get the 2008 pricing!